SAN DIEGO (AP) Free agent pitcher Garrett Richards and the San Diego Padres have finalized a $15.5 million, two-year contract. Richards will earn $7 million next year and $8.5 million in 2020 as part of the deal announced Friday. He can earn an additional $2.5 million annually in performance bonuses: $250,000 for each start from 21 through 30. 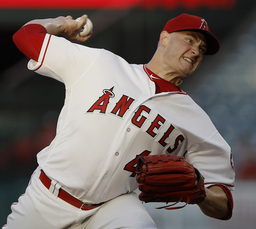 Richards was 5-4 with a 3.66 ERA last season for the Los Angeles Angels before reconstructive surgery in July. The 30-year-old right-hander was 45-38 with a 3.54 ERA with the Angels since 2011. Infielder Carlos Asuaje was designated for assignment to clear a roster spot.